The Madison Park Brianna Comforter Set is the perfect update to bring beauty and grace to your bedroom. 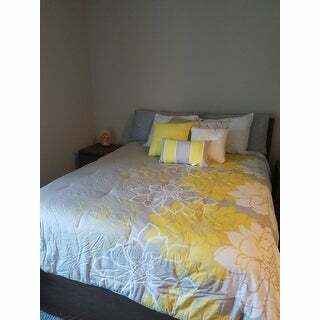 An over-scaled printed floral motif, in yellow and white hues, adds a soft accent to the grey cotton sateen comforter. The solid grey reverse provides rich touch of color to complement the top of the bed. Coordinating shams with a floral motif pair beautifully with the comforter, while three decorative pillows with embroidered details and fabric manipulation complete the ensemble. For a clean finish, a solid grey bed skirt with a 15-inch drop is also included in the bedding set. Machine washable, this cotton sateen comforter refreshes your space with its casual elegance and charming allure. I absolutely LOVE this comforter! My boyfriend and I were looking to brighten up our bedroom because we felt our room looked so gloomy with all the dark browns. I found this comforter online and thought that it was perfect! The grey and yellow color scheme looked so refreshing. I was a little weary of purchasing it because of other reviews that said the yellow is actually a more neon yellow. I decided to purchase it anyway and just figured I could always return it if I was unhappy. I was anything but unhappy when I received it! The colors are beautiful and appear just as they do on the website. We have been using it now for a few weeks and love it! Any guests we've had over always complement us on it and asked where we got it. I also loved the fact that it came with throw pillows! It completes the look and looks so chic! I was looking for a grey and yellow comforter for our guest bedroom. This was my favorite one I found online. My only complaint is that the yellow is much more neon than I'd realized. I was expecting a softer color but it's definitely a very bright neon. Our new bedding is very pretty. The colors and design are exactly what we wanted. My only complaints are that the throw pilliws are not the same shade of yellow as the flowers on the spread. They still look nice on the bed, but are not even close to the same color as the bedspread. Our other issue is that the comforter needs to be several inches wider. It barely covers the mattress on the sides and once 2 people are under it it isn't wide enough. It is definitely long enough and spills almost to the floor at the foot of the bed when we're in it. I got this about a week ago and I love, love, LOVE this comforter! It fits great on our queen pillowtop mattress (with a good amount hanging over the sides/end, which I like). It's soft and fluffy (but not so fluffy that it looks awkward on the bed), warm (but not too warm) and it's like sleeping under a cloud. I washed everything straight out of the box and it washed well, the filling didn't bunch and the colors didn't fade or bleed. The colors on the comforter are beautiful, and the shams and bedskirt match beautifully. The only two complaints I have: 1. The fabric on the shams is pretty thin- if you have a pillow that is not white you would need another pillowcase underneath or the color of the pillow would show through, and 2. The yellow on the pillows is NOT the same as the yellow on the comforter! On the comforter it is a bright sunshiny yellow, and on the pillows it is more of a light neon yellow. Because the pillows are at the head of the bed and the yellow on the comforter is at the foot of the bed, it isn't too noticeable and is not a deal breaker for me. But I just thought I'd mention that the neon yellow other reviewers are talking about is the pillows, and on the comforter it is more of a sunny yellow. I disagree with the previous reviews that said that the colors were more vibrant than the muted hues in the picture. I ordered it hoping the yellow flowers would be brighter than the actual picture and pop more, but the colors turned out to be completely accurate as depicted on the website. The comforter and the pillows were surprisingly of quality for the price. The bedskirt was a little iffy, but overall it is a great buy. Matches my room decor perfectly. The comforter is not too thick, perfect for fall or early spring weather. I was really disappointed after I received this product. The yellows were a lot more neon than the picture and the grays were much darker. What bothered me the most is that the yellows on the comforter didn't match the yellows on the pillows! They clashed. Also, I haven't even slept in the set yet and I already see at least one nick/scratch where the fabric was stitched in the comforter and one ink line like someone drew a 2 inch line with a pen. I absolutely lovr this comforter so much that I have purchased it 3 times now. I have it in a yellow and grey in my bedroom in my apartment in the Caribbean....I know, it's the Caribbean. But I love to turn on the AC when it is hot outside and snuggle under the covers. I have purchased it in the aqua and grey and the yellow and grey for my apartment in the USA. That way I can switch it up when I feel like and I also have a nice comforter for guests when they sleep over. It is pretty light weight but does the job. I am not much of a down filled comforter girl... I never really use the bedskirt it comes with but I do love the 3 decorative pillows and 2 cute pillowcases that come with it. I believe this comes in other colors as well...thought I saw a purple and grey one time! And boy am I tempted. If you don't like heavy, bulky comforters then this would work. Never really been a fan of floral patterns either but this one is a little more modern than most and doesn't overwhelmed the psyche with flowers. It is pretty easy to wash and even iron if you like no wrinkles. It really is a gorgeous addition to any bedroom in my opinion and honestly I never really write reviews.. I wanted something grey and white with a little bit of yellow as our last comforter set was super colorful and wanted to mute it down a bit. The colors of this set is perfect! I have gotten many, many, many compliments on it since I got it. I purchased a white sheet set, as my set only came with the comforter, pillows and bed skirt (that I didn't need). I also purchased the matching shower curtain because our bathroom is open to our bedroom so it blends perfectly. The materials are pretty cheap feeling but it should be expected with the price point it's at. I washed all of the bedding, including the comforter, when I received it and it didn't get ruined. The comforter is forever wrinkled - so if you're a perfectionist who can't stand wrinkles, this is possibly a bad choice for you. It's not bad, but it isn't 100% wrinkle free. I may be needing to get a new set eventually because our two cats have clawed away at the comforter as they were preparing a spot to sleep. So overall, the quality isn't great but the color is perfect! We have a light grey, fabric covered bedframe/headboard and white dressers with light grey/brown tops (Ikea) and everything blends perfectly. If I am able to post a picture, I will definitely do so! I was originally looking for a crisp white comforter for Spring and Summer and I found one - a Nautica microfiber king size. We positively ROASTED under that thing! It had to go. In perusing Overstock, I ran across the Madison Park Brianna and loved the colors. Yellow is my favorite color and gray is my Honey's favorite color so we were off to a good start. I had him check it out and he approved (not too feminine) so I ordered the King size...wasn't too worried about the previous reviews 'cause I happen to be partial to any shades of yellow, even chartreuse! It arrived (for some reason the box was named "Lola" which is our dog's name), I made the bed and voila! Our room was instantly brighter and refreshed. The comforter is lightweight and cool and the quality is quite good. Love the extra pillows too - really cute. The yellow is vibrant and as pictured; the gray is not dull - the balance of the 3 colors is really nice. We're pleased, this set will suit us nicely for just what I intended, Spring & Summer, until we go back to our heavier fall & winter sets. Ladies, just make sure the flowers are on YOUR side of the bed! Good buy, good value. This set looks great!! It is extreamly soft and cleans very well. I would recommend it to anyone!! I was very excited to receive my purchase and then I opened the box. I had read a prior review about the coloring being very bright but, I took my chances and thought it was only 1 person's opinion.. The picture shows a soft muted gray with splashes of yellow. The yellow is extremely bright and the flowers are also very large and they really stand out. The set is much busier than the picture leads to believe. I'm returning this item for a softer coloring option. This set looks really sharp on our new queen sized bed in the guest room. As others have noted, the yellow is more of a neon greenish yellow but looks very nice against the pale gray. Yes, the comforter is not reversible but of good quality and the bedskirt matches perfectly. I didn't really need so many accent pillows but they look great on the bed. I would recommend this set. California king? I don't think so! First off, the reviews are correct. The yellow is neon and not only that, it verges on the green side of yellow. I could overlook this, but when I put this newly ordered comforter on my bed, I was incredulous to see that the comforter is way too long and the sides are practically nonexistent. I took out the tape measure to see what was going on and then compared my measurements to what it says online. WARNING: overstock gives you the correct size for the dust ruffle, but the California king comforter and the king comforter are the EXACT same size. My bad for not checking the details, why would I need to check that? A California king and regular king are completely different sizes! So..... If you know the difference between a Cali king and a regular king, you can understand that my new "Cali" king comforter is now waaaaaay too long and sides are too short! Do not buy if you have a California king!! Overstock: please make this right! My wife recently decided it was time to change the look of our bedroom and wanted to start with the comforter set. We talked about it and she was surprised when I suggested yellow. She's always like yellow and was pleasantly surprised when this one came up on a search. The price was right, it arrived as promised and has been very comfortable to sleep on. The lack of sheets with the set allowed us to try a few different colors until we found ones that went well. All in all, a nice item for the price. I received my bed set a few weeks ago, and it looked just as I had thought it would. I think the colors in the picture were a close match to the actual set. I think that the quality for the price is appropriate. My only concern is the size. I ordered a king size bed set for my king size bed and it seems a little smaller than I would hope. If you have a queen, I would order a king set and if you have a king and like your comforter to drape over the side of your bed (as it does in the image) then this might now be the set for you. Otherwise, so far I love it! Just lovely. Makes the sunlight in my room seem brighter. Thus, making the room seem bigger. Well worth the money. Very happy with my purchase, beautiful comforter set ! This is a beautiful comforter set for spring. Airy and bright. I bought this set for our guest room. It looks and feels great and the quality is good for the price. If you're looking for a spring/summer comforter, I'd recommend this one. Not impressed. I wished I would have taken others comments more seriously. Paper thin, poor quality. Looks gorgeous in the pic, nothing more. What a disappointment. I purchased a king set for my queen bed (12" thick mattress) because I wanted the width to pass below the mattress sides. Well, it barely makes it and instead most of the length is from head to toe. Although it is a nice quality, something is off with the proportions of this comforter. the quality of this item is in question. the fabric is really tough and low quality. Would work better for a guest bedroom that isn't used everyday. But not for something that needs to keep you warm. I love the set. Looks just like the picture. Perfect fit. Looks expensive and fabulous!!!! "Is there a way to purchase the pillow shams separately ? Mine have faded and I LOVE MY COMFORTER!" Unfortunately, the shams are not available separately. "The picture shows the set with 2 matching Euro pillow shams, but it doesn't list them as part of the set. Do they come with the set? Is there some way I can order them to complete the look?" "I am looking to purchase the picture on the wall behind the bed." I was unable to find that picture but you may enjoy item# 20482033. "The title says 7 piece but the details & specs only lists 1. Comforter 2. Shams (2) 3. Bedskirt That's 4 pieces. Are the 3 decorative pillows included?" Yes, there are 3 pillows included. "What's the difference between Madison Park "Lola" and "Briannna"? They look exactly the same." The pattern is exactly the same but the Lola is a duvet and Brianna is a comforter. The Brianna should be thicker. "It says the fabric is 100% cotton. I would like to know what kind of filling for the comforter is used"
The comforter filling is cotton. The pillow filling is polyester. "Please, do you ship to Canada. Thank you"
This item can be shipped to Canada. Please see our International help page for additional information (https://help.overstock.com/app/answers/detail/a_id/5752/).